Another new feature we squeezed in between the DFT/DCLG launch and the BIS/MOD/FCO/AGO launch is a thing called “Groups”. It’s an evolution to the way we are modelling government leaders as people and roles (eg minister, permanent secretary, senior official etc) in the system. We had previously not made a distinction between the concept of “senior official” and “board member”. In the admin interface, the role type of “board member” was synonymous with the list of people that were displayed under a heading of “Our management”. This does not match reality, though, which is that many organisations’ boards are made up of a mixture of people including ministers, senior officials and (in MOD’s case) senior military leaders. So a person’s membership of a group (eg of one or more boards) needed to be modelled separately from their role (eg director general of finance or secretary of state). 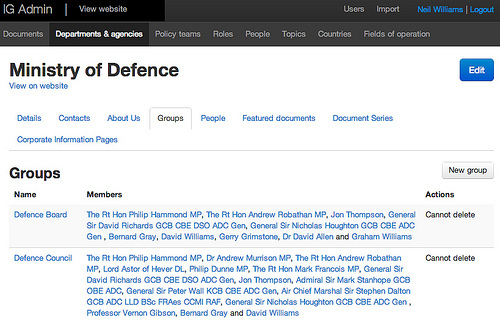 MOD have been the first to make use of this to group together the people who make up the Defence Council and Defence Board, and you can see that in action on their ‘Our governance’ page.